Mike Tolkin, head coach of the U.S. rugby team, didn’t like the Eagles’ second-half performance in their loss Sunday to Scotland. Speaking at the post-game media conference, Tolkin blamed the failure to sustain a winning first-half effort on poor lineout play, too many penalties and Scotland’s ability to keep the U.S. from pursuing the planned approach to the rest of the game. Chris Wyles, the U.S. captain, told the media he didn’t think Tolkin’s assessment was too harsh. Second-half letdown isn’t new to the Eagles. The U.S. stood 14-8 behind at the half against Samoa in its first game in the Rugby World Cup before giving up 11 points in the second half and only scoring eight more in the eventual 25-16 loss. So what is it that leads to second-half letdowns? Tolkin blamed it on the lack of professional experience on the part of many U.S. players. “Without professional play in the U.S., players don’t get those week-to-week tough games to harden them,” Tolkin said. Which raises the question of how U.S. players can get the kind of professional play that Tolkin is talking about. The formation of a professional league within the U.S. seems a daunting task. Where would the games be played? To collect admissions, control of the gate is needed, but most U.S. rugby games are played on open fields. So stadiums are needed. Does that mean playing on the narrow fields of American football stadiums? Building stadiums for rugby seems an unlikely financial event at this time although some clubs are beginning to secure their own grounds. The Glendale, Colo., Raptors and Atlanta Old White come to mind. Absent professional play in the U.S., prospective Eagles will continue to find it in other lands, where they compete for spots with players from Pacific Island nations. Even if Tolkin had his choice of 15 players from the top clubs in Europe, Australia, South Africa or New Zealand, he would have the problem of getting them all on the same field enough times for them to jell as a unit. Another daunting task given the competing professional schedules and the practice needs in the run-up to the World Cup. There’s still South Africa and Japan to play in this World Cup, but it’s hard not to look ahead to 2019 when the World Cup is in Japan. For now, it looks like developing players in the States and serving as a farm system for professional leagues in other countries may be the U.S. best hope for making it through pool play in a World Cup, which isn’t going to happen this time around despite Tolkin’s statement Sunday that the Eagles still intend to win in the two remaining games in Pool B. 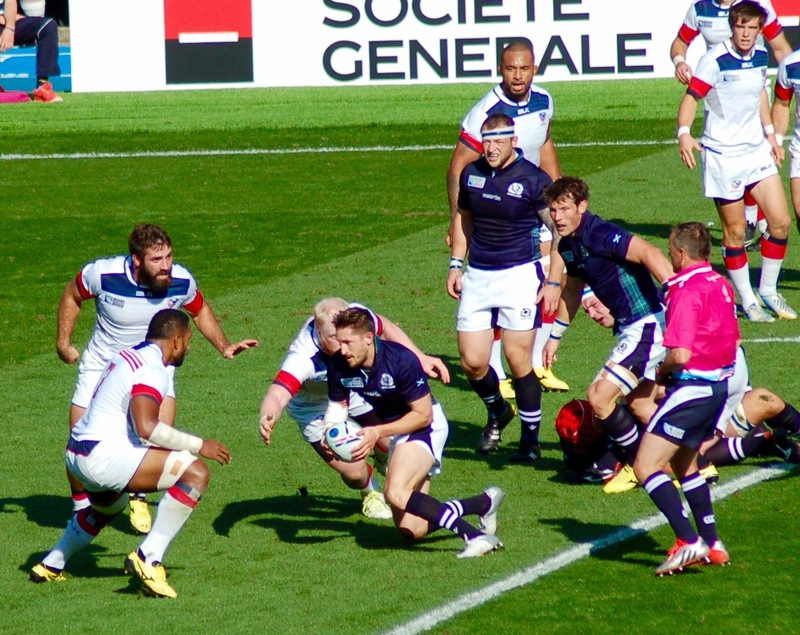 In the first half, aggressive tackling by the U.S. caused several mishandles by the Scotland team. Posted on September 28, 2015 September 28, 2015 by jbsaulPosted in Rugby, SportsTagged Eagles., rugby, RWC, Samoa, Scotland, USA Rugby.